Homes for sale in Northwest Arkansas. Search MLS in Northwest Arkansas. 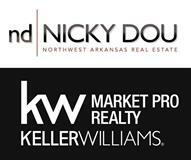 Brought to you by the #1 NWA REAL ESTATE AGENT NICKY DOU with Keller Williams Market Pro Realty. Search all Northwest Arkansas mls listings/homes for sale. Contact Nicky Dou for more info. 479.236.3457.